In a computor there are many different drives that make it what it is, in this page you will learn about some of them and what they are used for. This is a memory hard drive, it writes data with the metal arm on to the disc. This means you can get back all your files. However there is a problem, if you drop it the arm will scratch the disc and damage it. 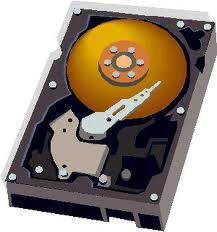 The hard drive contains several smooth, metal-coated disks called platters. Each platter is divided into a number of narrow, circles called tracks, which run from the the inside of the platter all the way to the edge. Each track is divided into small sections called blocks. To retrieve a piece of information, the head moves to the exact track on the platter. An optical drive is about the size of a thick soft cover book. The front of the drive has a small Open/Close button that ejects the drive bay door. This is how media like CDs, DVDs, and BDs are inserted into and removed from the drive. The sides of the optical drive have pre-drilled, threaded holes. The optical drive is mounted so the end with the connections faces inside the computer and the end with the drive bay faces outside. The back end of the optical drive contains a port for a cable that connects to the motherboard. The type of cable used will depend on the type of drive but is almost always included with an optical drive purchase. The motherboard serves to connect all of the parts of a computer together. The CPU, memory, hard drives, optical drives, video card, sound card.